This former hotel has one of the most vigorous Beaux Arts facades along Broadway but sadly it is missing its original elaborate cornice. The very ornate, red-brick and limestone building was designed by Harry Mulliken in 1902 and in his fine book, "On Broadway," David Dunlap noted that Mulliken also designed the Cumberland, the Thomas Jefferson and Spencer Arms hotels on Broadway. 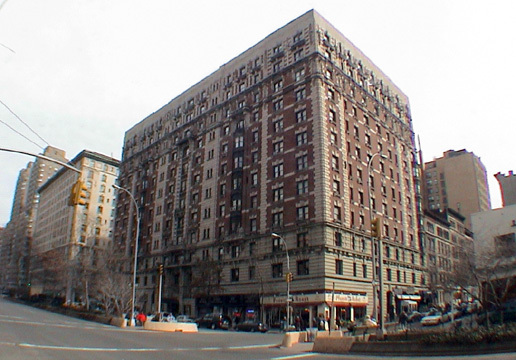 This building, Mr. Dunlap wrote, "claimed to be the largest uptown hotel, with `all the comforts of New York City's best Hotels at one-third less price.'" It has 461 rental apartments and is notable for its extensive use of quoins especially in the central bay above the Broadway entrance where their use is most imaginative. 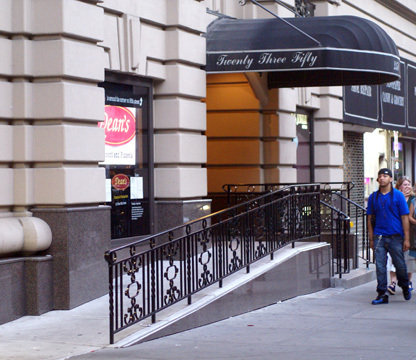 The pre-war building has a large stainless-steel marquee with a four-step-up entrance with a disabled ramp side approach, a doorman, inconsistent fenestration, numerous decorative balconies and other architectural detailing. It has no garage, no sidewalk landscaping, no health club and no roof deck. This is a very central and lively Upper West Side location. This intersection has excellent bus service in all directions and a subway station and two newsstands. There is a supermarket across the street, and excellent local shopping with many restaurants nearby. Riverside Park is only two blocks away to the west and the north side of this building is across the street from the large and famous Belnord apartment building that occupies the entire block between 86th and 87th Street and Broadway and Amsterdam Avenue. In an January 7, 2007 article in The New York Times by entitled "Along Broadway, Jettisoned Cornices Are Being Rebuilt ," Christopher Gray wrote that John C. Calderón has redesigned the parapet in complementary red brick and cast stone laid in alternating stripes." According to Mr. Gray, Mr. Calderón, "wanted to replicate the original chunky projecting cornice but said that the cost was prohibitive, even though projecting cornices serve to keep moisture away from the vulnerable upper walls." "So," the article continued, "he redesigned the rooftop, rebuilding the vertical wall  the parapet  in red brick and cast stone laid in alternating stripes. It has an art moderne look, as if it dated to the 1930s. Mr. Calderóns work is uncannily like the upper section of the 1980s apartment house diagonally across the 86th Street intersection, but he said that any similarity was unintentional. He sought to complement the rhythms of the brick and stone detailing of the rest of the Bretton Hall, and also leave room for see-through balustrades for future rooftop tenants." The cornice replacement was part of a $1 million restoration of the building. In his article, Mr. Gray observed that for most of its length on the Upper West Side Broadway "is unfettered by landmark regulation, and owners and architects can do as they wish with the slightly threadbare prewar apartment houses. As a result, many buildings scalped of their cornices in the mid-20th century have been recrowned in the last decade." "The owners of the Midway Hotel at Broadway and 100th Street, have spent $100,000 to restore the cornice, using a smaller fiberglass version of the original. There are at least a dozen examples, some restorations, others totally new works, but all demonstrating widely varying ideas. As construction heights reached 10 to 15 stories in the 1800s, the crowning element of the cornice became the standard for how a building should meet the sky.Typically, it followed a classical design and was made either of copper or galvanized iron. Stone and terra cotta were sometimes used, but metal could be shop-molded into intricately detailed pieces while remaining lightweight. A mile's walk down Broadway, beginning at 100th Street, offers up a sort of design studio in contemporary cornice repair for the 10-to-15-story apartment house. 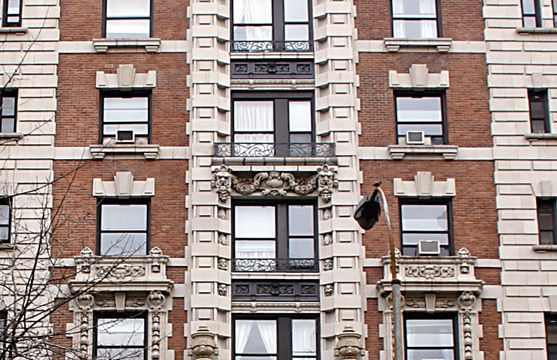 At 100th Street rises one of Broadway's most sophisticated works, the 1909 Allenhurst. In that year, The New York Times wrote that the two upper stories "will be particularly ornate, with a large overhanging cornice." Indeed, its architect, William Rouse, gave the building a particularly notable one of copper, which has a higher initial cost than galvanized iron but does not need regular painting. Later, the Allenhurst became a single-room-occupancy hotel, the Midway, and in the winter of 1992 a storm ripped off one part of the cornice. The next spring, the owners took off most of the rest....The Midway's replacement cornice was installed by the Architectural Fiberglass Corporation, whose president, Charles Wittman, says fiberglass is now the material of choice for cornice installations. Because of its stabilizers, fiberglass doesn't need to be painted, he said, adding that his company has installed 13 miles of fiberglass cornice in the metropolitan area."